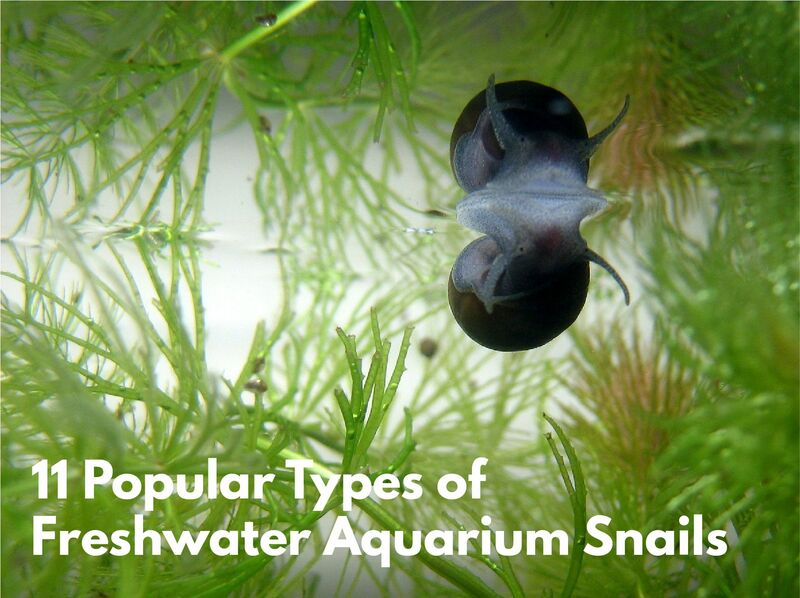 Aquatic snails can be a really fun and useful addition to your aquatic habitat! They help keep your aquarium clean and clear by feeding on aquatic debris such as algae and fish waste. Also, snails are pretty cool! Many are simply beautiful to look at, and all are fascinating to observe as they make their way around the aquarium. You might think of snails as a sort of secondary addition to your aquatic habitat, though it’s possible you’ll enjoy them just as much as your other water-dwelling pets. Snails are pretty low maintenance, too. They don’t require much light or extra food. They also tend to mind their own business, making them suitable tankmates for lots of other aquatic animals. In the wild, freshwater snails live in rivers, ponds, lakes, and swamps. Most of these species adapt very well to life in a home aquarium. These are the kinds of freshwater snails commonly seen in fish and turtle tanks. They are classified under the popular names used by most pet stores and hobbyists. If you have an algae problem, Nerite snails will solve it. These snails love chowing down on lots and lots of algae, which is one of the reasons they’re among the most popular types of aquarium snails. These little tank-cleaners are also pretty cute, with a compact shell and a range of interesting patterns. Nerite snails are mellow and tend to co-exist peacefully with other aquatic life. They may be low-key, but Nerites are far from boring. Generally quite active, these little guys spend a lot of their time traveling around the aquarium searching for bits of tasty algae and fish waste. It’s also easy to keep Nerite populations down compared to some other species, since they do not reproduce asexually. In addition to this, they will not produce young unless they’re in brackish water. This means that you shouldn’t have to worry about seeing any Nerite offspring in your freshwater aquarium. Nerites are strong and generally fairly easy to care for, though it’s difficult for them to right themselves when upside down. Take care when placing them in the tank for the first time, and don’t put them on their backs. You can gently nudge an overturned Nerite snail to its upright position using your hand or an aquarium net. Nerite snails may make their way to the top of your tank, and even spend some time above the water line. This is normal and fine. Just make sure your lid is secure enough so they can’t escape or become entrapped. Pet stores and breeders may classify Nerites into different groups, usually based on their unique markings. Here are some varieties you might see. Zebra Nerite: Zebra nerites get their name from the bold striped pattern on their shells. Most often, the stripes are black and yellow. 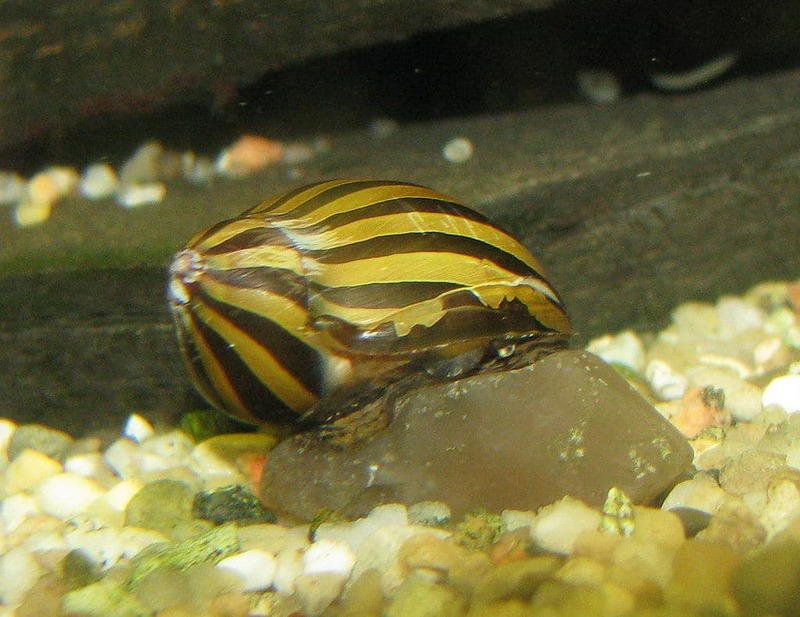 Tiger Nerite: These snails are somewhat similar to Zebra Nerites, as they have stripe-covered shells. Tiger shells, however, display more broken and jagged stripes, whereas zebra nerites have neat, somewhat evenly spaced lines. Tiger nerites are usually black and orange instead of black and yellow. Black Racer Nerite: These snails are distinguished by their black shell, which gives them an elegant appeal. Horned Nerites: Horned Nerites have beautiful yellow shells, accented with stark black swirls. Most distinctive, of course, are the signature horns which project from its shell. Some other names you might see for Nerite varieties include Marble, Ruby, and Plain Nerites. The Assassin snail gets its descriptive name for its zero-tolerance policy with other snails. This snail does not eat algae or fish waste. It eats other snails. This can actually be a good thing if you’re experiencing an invasion of unwanted snail species. Be careful what you wish for, though, when introducing the assassin to your tank. You’ll need to provide them with enough food, even after they’ve culled the population of invasive species. Assassins cannot reproduce without mating, so you don’t have to worry too much about them multiplying rapidly. What’s more, assassin snails are quite gorgeous to look at with elongated shells that are often adorned with brilliant colors and swirling stripes. Trumpet snails are a popular choice for aquariums, since they gobble up algae at an impressive rate. Unlike many other types, Trumpet snails tend to burrow down under rocky substrates. By doing this, they can help to provide substrate aeration – releasing potentially deadly pockets of gas that could otherwise build up and become dangerous to your fish. One drawback of having Trumpet snails in your aquarium is that they reproduce rather quickly, and you could end up with a much larger snail population than you were hoping for. Trumpets are asexual, so they don’t even need a partner to do this. Each Trumpet snail can produce one live baby per month. The shell of a Trumpet snail is long and conical, sometimes displaying a solid color with others showing various patterns. 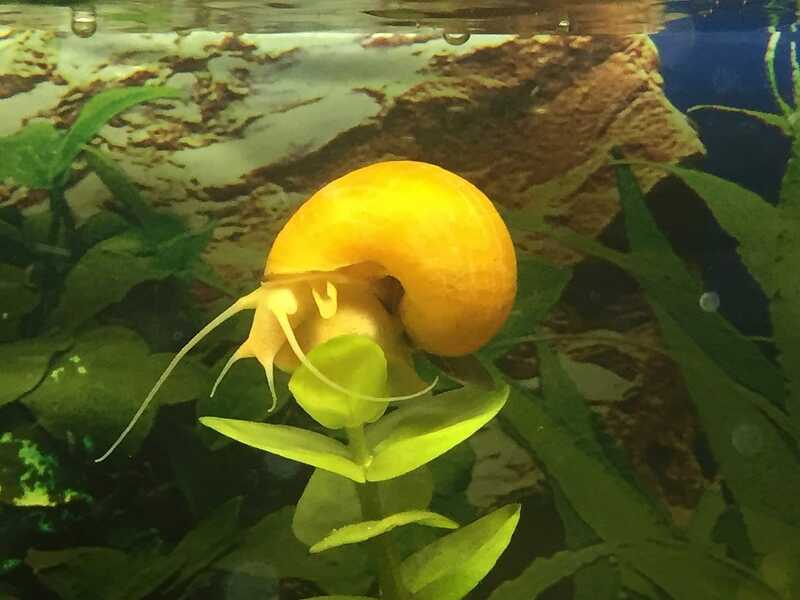 This snail adds a vibrant accent to your aquarium with its brilliant yellow coloring. Incas will definitely devour some of your unwanted algae. Watch out, though – they might nibble on your aquatic plants as well. In fact, Gold Inca snails are such voracious eaters that it’s a good idea to supplement their diet with some fish flakes or algae wafers. Particularly active, these curious snails can easily make their way out of an unsecured aquarium so keep a close watch on them. 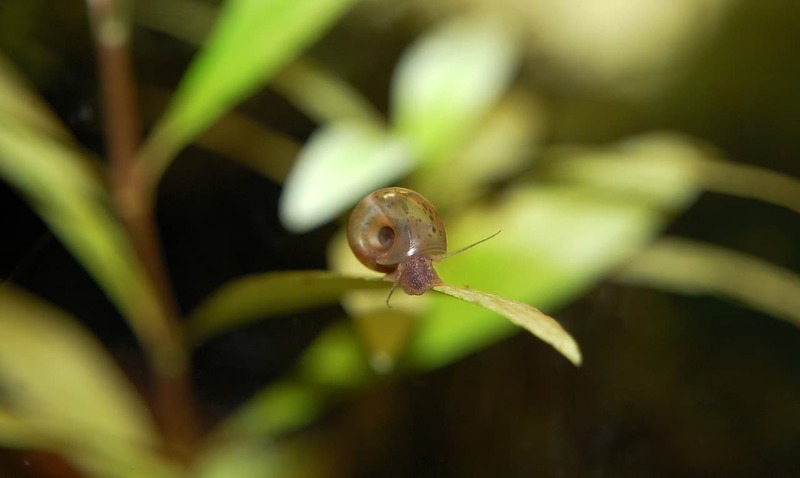 Whether the Ramshorn snail is a good addition to your freshwater aquarium depends on who you ask. Ramshorn snails are attractive, displaying soft pink, peach, or blue coloration. They have a compact shell, delicately curved like a nautilus. However, this kind of snail is known to reproduce quite rapidly and can go from pet to pest pretty quickly. Ramshorn snails are great at cleaning up fish and turtle aquariums, eating some types of algae along with fish waste and discarded food. Their eggs are tiny and can hide in various places around your tank. You may have to periodically remove some of them to keep your aquarium from getting too crowded. 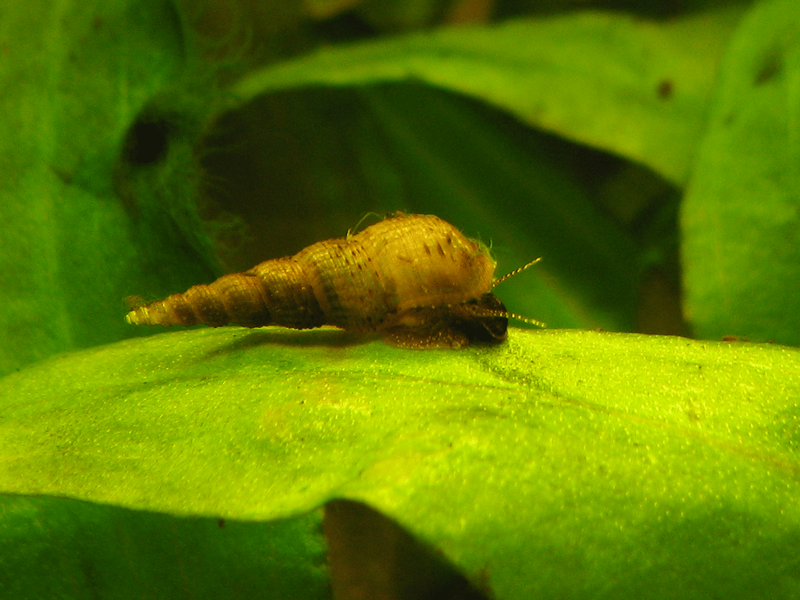 The Rabbit snail makes a pretty and peaceful addition to most freshwater aquariums. This type of freshwater snail is distinguished by its long, slender shell marked by deep, swirled grooves. 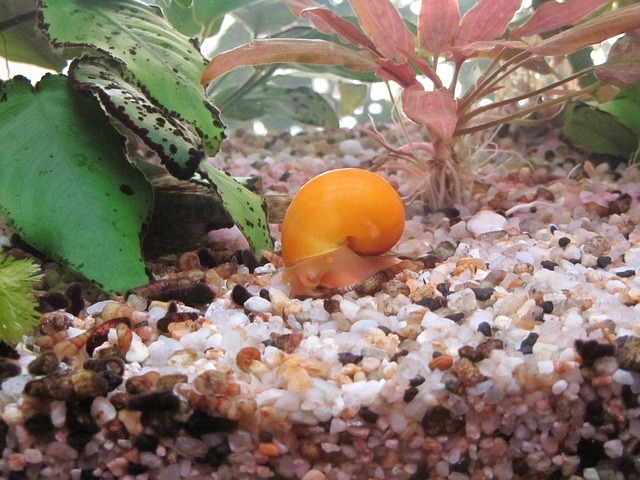 Rabbit snails do like to eat the algae and other plant matter that accumulates in an aquarium, although many experts recommend supplementing their diet with algae wafers or fish flakes to ensure their optimal health. They generally do not eat aquatic plants. Java Ferns, however, seem to be the exception to this and it’s not uncommon to hear of a Rabbit snail snacking on one of these particular aquarium plants. 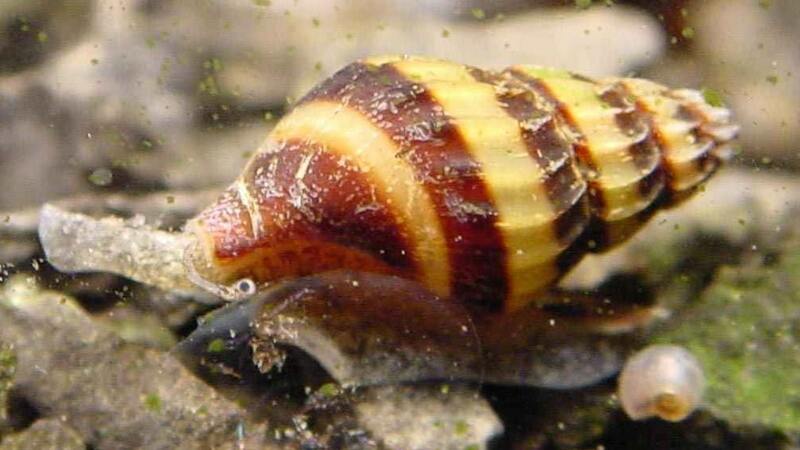 Another commonly used aquarium-cleaning snail is the Mystery snail. Mystery snail shells vary widely in terms of color and markings. Most are shades of brown, gray, and black. Some are solid, some are patterned. The body of a mystery snail can also run the gamut of colors, ranging from black and grey to yellow, green, and blue. Most have striking orange accents around their bodies. Another thing many hobbyists appreciate about Mystery snails is that it’s fairly easy to keep the population under control. They bear live young, meaning they have fewer offspring than egg-laying snails. They typically only reproduce about once per year. This makes it easy to monitor and regulate the number of snails in your tank. Ivory snails are striking, with milky white shells and bodies. Rather than blending in to your aquatic environment, these snails stand out against the greens, blues, and browns of typical aquarium decor. Active Ivories are fun to watch, as they tend to be very high-energy when traversing the tank in search of food and interesting places to explore. Ivory snails are usually quite gentle in nature and will not attack any of their tankmates. When inactive, Ivory snails will often find a place to hide away and rest. Sometimes, however, they will retract into their shell and simply float around the aquarium – which is quite a thing to observe in itself. Ivory snails eat algae and other tank debris, including fish waste and discarded food. Snails, like any other aquatic pet, create waste that affects the chemistry of the water in your tank. Monitor the ammonia and nitrite levels in your water – and check the pH once in a while. Most pet stores will provide cost-free water testing if you bring in a sample. Note that it’s better to start with a couple of snails and add more if you need them. Here are a few more important notes about aquarium snails. Besides keeping the water just right, there are other things to keep in mind when considering the health and safety of your snails. The following things pose a risk to your snail. Aggressive tankmates: Generally speaking, snails are good additions to most freshwater aquatic environments. It is not advisable to place them in a tank with aggressive pets, though. Don’t put snails in an aquarium with the following animals. Filter intakes: Smaller snails can become trapped in the slats of your filter intake. This can result in potentially fatal injuries. Prevent this by making sure you have a filter with very small slats or that you have some kind of protective medium covering the openings. Remember that curious little snails will traverse every inch of the environment you provide for them. Make certain there’s nothing that could ensnare or injure them. Escape: If your lid isn’t secured (or you don’t have one), it’s easy for roving snails to escape their enclosure. This is dangerous and usually fatal for snails who encounter all kinds of hazards outside the aquarium. Overcrowding: Placing too many of anything inside one enclosure can lead to big problems. Make sure there’s plenty of room for your snails and the other creatures they share the aquarium with. Overcrowding can create an unhealthy environment for all your tank’s inhabitants, leading to illness and even death for your pets. Look for snails that seem active. Healthy snails will have attached themselves to something in the tank, such as the glass walls or a decorative plant. Snails that appear not to move at all or that float around the tank may be sick or even dead (though not always). Be careful when purchasing healthy snails that share a tank with sick snails, too, as there’s a chance unhealthy conditions in the habitat could affect your snail and your aquarium. Be aware of your tank conditions. Make sure that the needs of a particular snail align with the needs of the other pets in your aquarium. Select snails that thrive in a similar pH and temperature range as your other aquatic friends. There are a couple of ways you can end up with some uninvited guests in your aquarium. As previously mentioned, some species are capable of rapid reproduction – potentially causing a population problem in your tank. Additionally, snails can stow away on fish transport bags or aquatic plants from pet stores. Here are a few tips for avoiding snail overpopulation in your aquarium. Examine and wash objects before introducing them to your tank. Check for snails and egg clusters on any plants or decor items you add. Try not to add too much food to your tank at one time. Watch your pets at feeding time, and don’t give them so much that you see lots of waste floating around afterward. 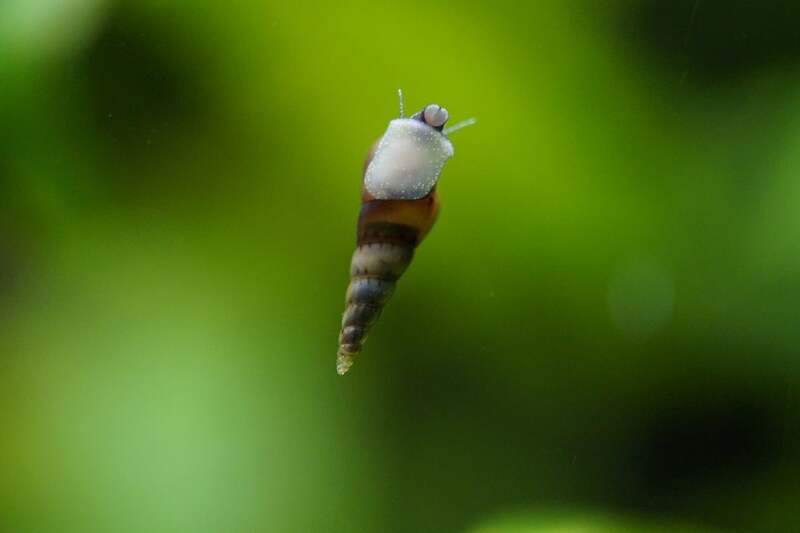 Excess food in the tank could fuel a snail population spike.Despite any preventative measures you may take, it’s still possible to end up with too many snails and/or unwanted species of snails in your aquarium. Here a couple of tips for handling that. You can remove excess snails by hand or using a net. You can also try this method: Place a lettuce leaf on top of the water and let it sit for a while. Within hours, the snails will likely have attached themselves to the lettuce, making it easy to remove all (or at least most) of them at once. Take care when disposing of unwanted snails. In some areas, wildlife officials do not permit certain species to be set loose in the wild. If you’re not sure what to do with excess snails, call around to local pet stores. They will likely have helpful advice, and some may even be willing to take the snails off your hands for use in their aquariums.